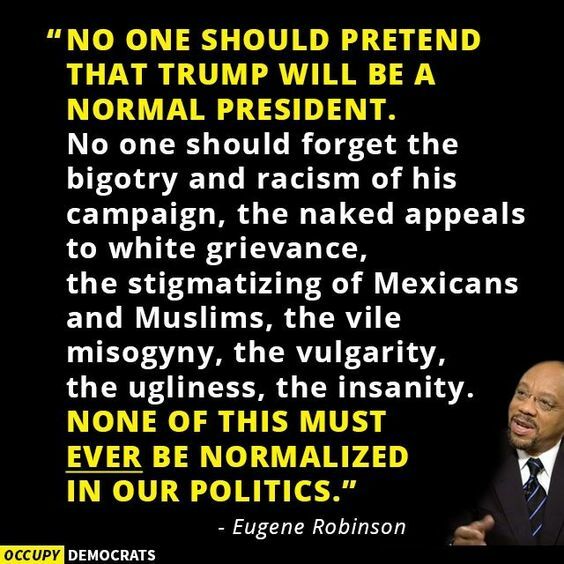 A follow-up to yesterday’s post, this powerfully direct statement by Eugene Robinson is a plea for all of us to stand up to the intentional destruction of common decency that the election of the #BLOTUS represents. The open misogyny, ugliness, and vindictive behavior of those in power should never be normalized. No person, especially the President of the United States, deserves respect when basic human decency seems to be a foreign concept to them. Leadership requires far more than wealth and power. When children act inappropriately we are quick to teach them how to behave properly. Isn’t it time we do the same with the leader of the free world? This entry was posted in News & Views, Quotes and tagged basic human decency, behaving, bigotry, BLOTUS, Eugene Robinson, forgetting, free world, Hispanics, insanity, leadership, Mexicans, misogyny, Muslims, normalcy, power, President, pretending, racism, SNAFU, stigmatizing, teaching, ugliness, vile, vulgarity, white grievance on April 12, 2017 by Ray Buchanan. 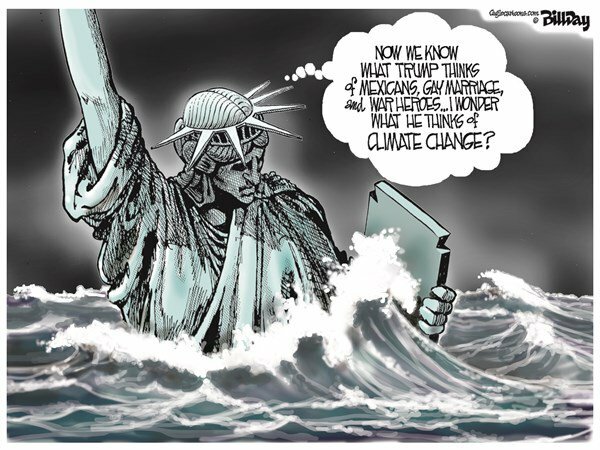 We all know that climate change cannot be real, right? It’s all just another scare tactic cooked up by progressives to keep honest business folks from making a decent profit. And doesn’t the “good book” tell us that God created MAN to have control over the earth? That means (according to the #BLOTUS), that we can grab whatever we want. Finally, we finally have a leader who can demonstrate the good life. This entry was posted in Facts & Statistics, News & Views and tagged bible, BLOTUS, climate change, earth, gay marriage, global warming, God, Good Book, good life, greed, Mexicans, profit, progressives, scare tactics, war heroes on April 4, 2017 by Ray Buchanan.